Rock climbing is a growing sport in Bermuda and its attracting more and more youth by the day. If there is any indication to that, it would be the growing number of climbing routes in the island (there are some total of 300 already). Essentially two types of rock climbing takes place in the island. The first is Deep Water Soloing (DWS) which is a solo climbing along steep rock face without any gears. Your only protection is your skill and the water below. DWS is done on rocks that emerge from the water and the water below acts as the safety. DWS in Bermuda is carried out during high tide when the water level is high and therefore safer for a jump out of the rock face. The other type of rock climbing done is the Sport Climbing where gears such as ropes, helmets and also pre-fixed anchors (like nails on rock face) are used while climbing. Note that all types of rock climbing have high risk of injury and even life, and to be done in Bermuda only by skilled & experienced persons, and at their own risk. In Deep Water Soloing (DWS), one of the best and most popular venue is Clarence Cove in Admiralty Park House located on north shore at the outskirts of Hamilton City. There are few manmade caves here and to the west of it is the Hogfish Bay where the arching rocks offer great opportunity for climbing. 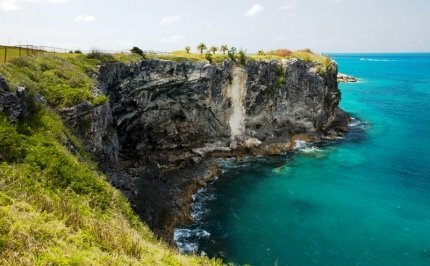 Note that Admiralty Park is also one of the most popular places for Cliff Jumping in Bermuda. So once you climb up the rock, you can also try out cliff jumping here. There are some 250 climbing routes already marked out in Bermuda for DWS. For one of the best places in Bermuda for sport climbing is at Great Head of St. Davids where the steep rocky face of a 100ft high cliff offers the climbing routes. This is by far the largest rock in the island. The views of the Atlantic and the canons of the fort from Great Head are awesome. The Great Head actually has two rock faces - the north and the south. And there are several climbing routes on both North and South rocks of Great Head.